RER FLV Converter is a practical utility that works, as its name suggests, for FLV file conversion. All the conversions can be done both ways - from FLV to other videos, and from others to FLV easy and fast. RER FLV Converter can be used like FLV to iPod converter, FLV to iPhone converter, FLV to Apple TV converter, FLV to 3GP converter, FLV to PSP converter, and FLV to Zune converter. Free to try, free upgrades. 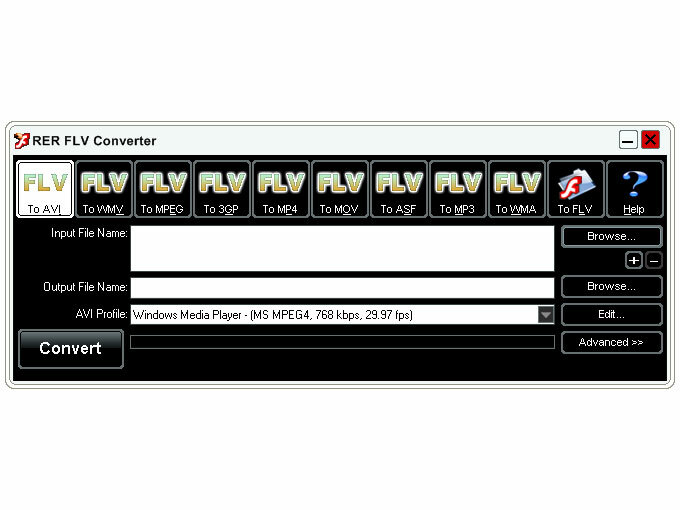 RER FLV Converter supports 3GP/3GPP, 3G2/3GP2, MJPEG, AVI, DivX, Xvid, MPG, MPEG(MPEG-1/2), DAT, MKV(Matroska), QuickTime(MOV,QT), MP4,?M4V, VOB, WMV, ASF, TS, MPEG-4 AVC, DVR-MS, H.263, H.264, X.264 to FLV with ease. Support converting FLV to video and audio formats like MP4, MOV, 3GP, 3G2, MPEG, MPG, AVI, ASF, WMV, H.264, MJPEG, MP3 and WMA. Qweas is providing links to RER FLV Converter 3.7.3 as a courtesy, and makes no representations regarding RER FLV Converter or any other applications or any information related thereto. Any questions, complaints or claims regarding this application RER FLV Converter 3.7.3 must be directed to the appropriate software vendor. You may click the publisher link of RER FLV Converter on the top of this page to get more details about the vendor.